Every once in a while the debate over the New York State budget turns briefly to transportation, and we see where our leaders have their priorities. Back in January, Streetsblog reported that the Governor had allocated $150 million to the MTA Capital Plan for next year, 5.7% of the budget for that plan, while requiring the MTA to borrow six times as much. Even this paltry amount was blocked by the State Senate, until a budget deal was hashed out by the infamous "three men in a room": Governor Cuomo, Assembly Speaker Silver and Senate Majority Leader Skelos. DeFrancisco, Libous and Skelos: making sure drivers get as much as possible. State Senate Budget Committee chair John DeFrancisco made his priorities clear to Glenn Bain of the Daily News: "DeFrancisco also expressed concern that funding for upstate road and bridge projects were being treated fairly," wrote Bain. "We don’t have too many MTA trains going to Syracuse," DeFrancisco told him. When the deal was finally announced, Dana Rubenstein of Capital New York surmised that "what the Senate Republicans might have been holding out for, in this case, was more money for non-city road and bridge projects." 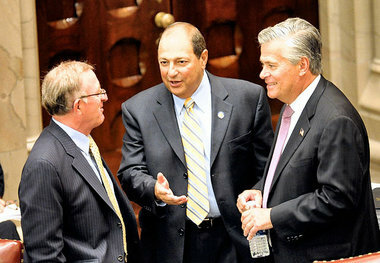 Republican Senators, in particular Tom Libous of Binghamton, the Deputy Majority Leader, were also concerned that there would be "parity" in road funding between upstate and downstate, and last week State leaders produced a "memorandum of understanding" that would send "$751 million to the upstate regions north and west of the Hudson Valley. ... the Hudson Valley, including Westchester, Rockland, Putnam, Ulster and Dutchess counties, would get up to $158 million, Long Island would get up to $291 million, and New York City would get up to $415 million." Let's combine the public transit commuters from the Hudson Valley, the City and Long Island as the total constituency of the MTA. Some of them may only use their local county bus systems or even private buses like Red and Tan, but I'm guessing that most of the commuters from outside the city ride Metro-North or the Long Island Rail Road. We have to exclude Upstate transit commuters, because those transit agencies apparently got zero capital support from the State budget. You could say that people who walked to work benefited from State DOT money, but the state DOT spends so little of its money on pedestrian infrastructure it might as well be zero. True, everyone indirectly benefits from roads because they get things delivered by truck, but the enormous inefficiencies of truck freight would probably cancel out any indirect benefit. You can see that something's off there. Needless to say, bicyclists are a tiny share of commuters, but none of the percentages match. Now what if we allocated it differently, based on population? So there you have it. The Upstate drivers, led by Tom Libous and John DeFrancisco, and the Long Island drivers, led by Majority Leader Dean Skelos and Transportation Chair Charles Fuschillo, each got over $112 million more than they would if it were based on simple commuting numbers. City drivers, led by Republicans Marty Golden and Andrew Lanza and Independent Democrats Jeff Klein and Diane Savino, got $163 million more. A tiny bit of this ($20 million) came from Hudson Valley drivers, but the vast majority, $369 million, came from city transit riders. There is no "parity" here, even for drivers. The formula is simple: the more powerful "legislators" get more money for their constituents, and every driver is worth as much as 4.5 transit riders. Keep this in mind next time you hear Skelos, Fuschillo, Golden, Lanza, Klein and Savino complaining about MTA cuts. They may act like they care, but when the money's on the line they're not fighting for transit riders. Good work here, as always. Question: How did you calculate the capital funding by population? Thanks! I just multiplied the total by the percentage of population in each constituency. Sorry, I meant the capital funding approved. I've never seen such a clear cut allocation set by county (or region) for the state transportation capital budget. Oh, that? It's in the Memorandum of Understanding. Yeah, it seems like the conditions that would lead to that kind of disclosure are fairly rare. The state DOT has actually been an *obstacle* to getting pedestrian facilities or bike lanes installed on state roads (as they demand giant road widenings in exchange), so yeah, you can count precisely zero of the money towards upstate pedestrians. Another interesting exercise would to run these figures by what proportion of the costs they impose on the state these different groups cover. I'm a New York City cyclist and I blogged last night about this issue. It costs me, I think, about the same to keep my bike running as it would to go by subway. But the MTA covers less than half its revenues from the farebox - and I impose hardly any costs on either the state or city budget. My ultimate conclusion is that none of the sums for transport funding around New York works. Cars are heavily subsidized because fuel taxes aren't high enough. MTA fares have to be unrealistically low to prevent people from going by car instead. The only realistic solution is a substantial congestion charge for the city - and no-one seems ready to introduce that.